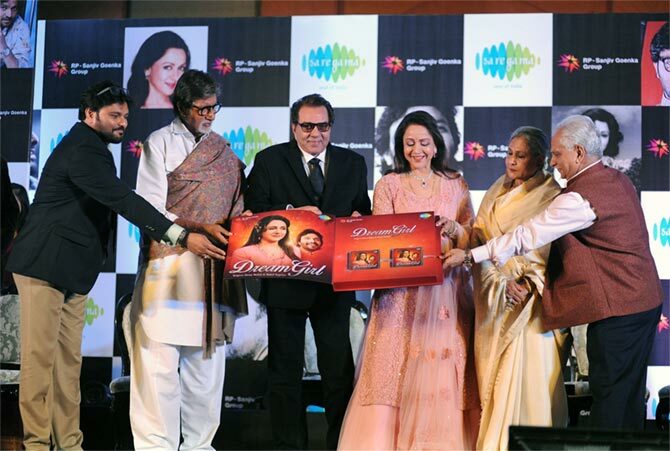 It was no less than a 'Sholay Returns' as Amitabh Bachchan, Dharmendra, Jaya Bachchan and filmmaker Ramesh Sippy shared the stage for the launch of Hema Malini's new album Dream Girl. The album has been composed by Babul Supriyo and features his duet with the 67-year-old actress. While on a political trail with Supriyo, Malini had told him about her interest in singing. The album features her duet Aji suniye to zara, kya hai manjra with Supriyo, apart from the two Bengali songs that she had originally recorded for the legendary Kishor Kumar. "I was excited to sing those two Bengali songs, which I had recorded for Kishorda long back... I've been a dancer, an actress but today I can't believe as a singer I am in front of you," Malini said. Bachchan said that looking at Malini's ability to juggle many things, he was compelled to try a few things himself. "Jaya was saying Hemaji works so much, we don't work at all. She is in politics, goes to the Parliament, does dance, now she's singing too... We don't do anything. I want to assure you after today, even we will do something like this," said the actor. 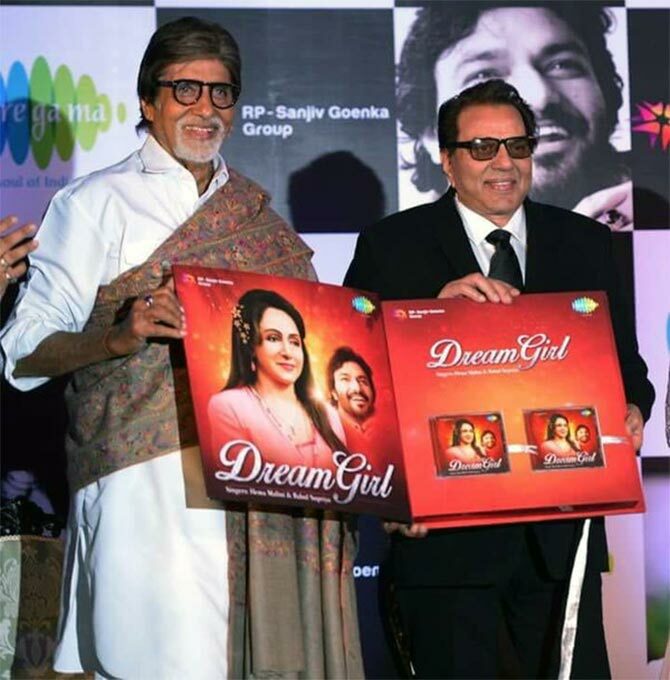 Dharmendra recited a poem written by him and congratulated his wife on the launch. Hema said she wanted to sing a song written by Dharmendra with Bachchan. "They say you have to reinvent yourself. So Dharamji has reinvested himself. I have a wish. You write such good sher-o-shayari, so you write and I want to sing. Even Amitji will sing," she said. To which Bachchan replied, "It has been 42 years since my marriage and for 42 years I've been singing only." Jaya joined the banter and said, "He has been singing for 42 years and I have been dancing." Lyricist Sameer Anjaan is a force to reckon with in Bollywood. After being in the industry for more than three decades, the lyricist has achieved a new feat. He has been awarded a certificate by the Guinness World Records for penning down the maximum number of film songs till December 2015. 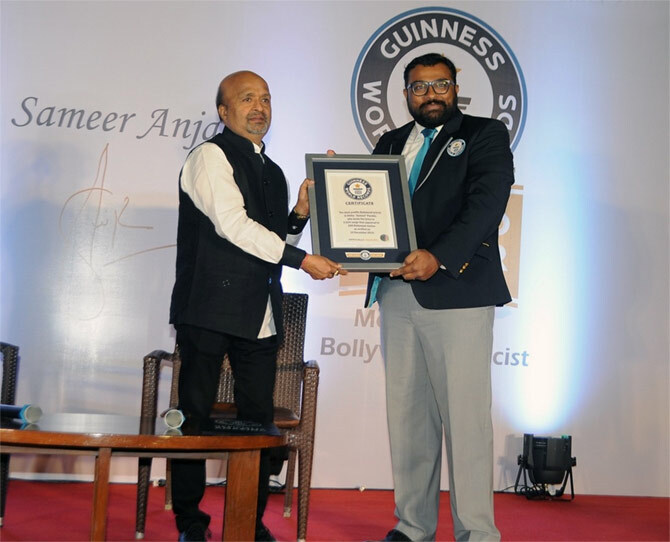 Sameer Anjaan, who has many hits to his credit, has wrote lyrics for as many 3524 songs. PIX: Salman, Anushka at Arpita's baby shower!